This is the limited edition of the first edition of Coyote Waits, which is Tony Hillerman's tenth Navajo Mystery novel. This edition was published in 1990 by Harper & Row Publisher's in New York, New York. 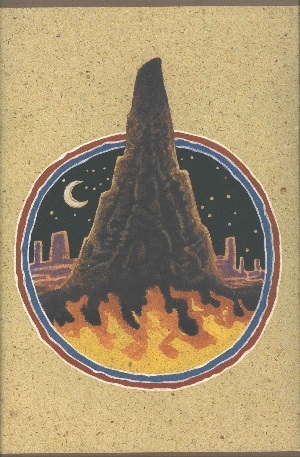 The edition comes with a multicolor slipcase designed by Peter Thorpe that features a volcanic mountain surrounded by flames with a background of a night sky. The book was designed by Alma Hochauser Orenstein. Format: Hardback, 24.9 x 16.3 cm. Binding: Tan boards with royal blue cloth binding. The spine features the author, title, and publisher printed vertically in gold.